I am trying to create an AppleScript to automate a software called Eagle. The idea is to open a file in Eagle and export it as a PNG file. The script is more or less working. At one point I invoke the export window.. I need to fill the text field "resolution" with 2400 but Applescript call this a "incrementor". group 1 of window "Export Image" of application process "eagle"
button "OK" of group 1 of window "Export Image" of application process "eagle"
button "Cancel" of group 1 of window "Export Image" of application process "eagle"
text field "File" of window "Export Image" of application process "eagle"
static text "File" of window "Export Image" of application process "eagle"
button "Browse..." of window "Export Image" of application process "eagle"
checkbox "Clipboard" of window "Export Image" of application process "eagle"
checkbox "Monochrome" of window "Export Image" of application process "eagle"
incrementor "Resolution" of window "Export Image" of application process "eagle"
static text "Resolution" of window "Export Image" of application process "eagle"
static text "dpi" of window "Export Image" of application process "eagle"
static text "Image Size" of window "Export Image" of application process "eagle"
text field 2 of window "Export Image" of application process "eagle"
static text "pixel" of window "Export Image" of application process "eagle"
pop up button "Full" of window "Export Image" of application process "eagle"
list 1 of pop up button "Full" of window "Export Image" of application process "eagle"
static text 1 of list 1 of pop up button "Full" of window "Export Image" of application process "eagle"
static text 2 of list 1 of pop up button "Full" of window "Export Image" of application process "eagle"
static text "Area" of window "Export Image" of application process "eagle"
button 2 of window "Export Image" of application process "eagle"
button 3 of window "Export Image" of application process "eagle"
button 4 of window "Export Image" of application process "eagle"
image "Export Image" of window "Export Image" of application process "eagle"
static text "Export Image" of window "Export Image" of application process "eagle"
The problem is that there is no text field called "Resolution". There is an "incrementor" called "Resolution". How do I set this "incrementor" to be 2400? and also the same line with 2400 between quotes but there is no error and the field does not change. I have squeezed google and nothing. 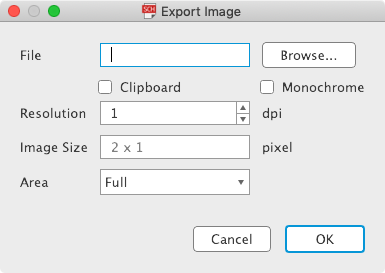 set x to value of incrementor "Resolution" of window "Export Image"
So, applescript is getting the correct control. How in the hell do I set that with a value? set theProps to the properties of incrementor "Resolution" of window "Export Image" of application process "eagle"
set subElements to every UI element of incrementor "Resolution" of window "Export Image" of application process "eagle"
If nothing else can be found to allow you access to set that value, you can probably locate the location of the text field on screen by getting the element's properties by UI scripting, then simulate a mouseclick within the text field to activate it, and then either simulate the keystrokes you need, or set the clipboard to the value you need and paste. Is the process called "eagle" or "Eagle"? Process names are case-sensitive. Otherwise, I see from System Events's dictionary that besides a value, incrementors have maximum value and minimum value properties which can't be changed. Is 2400 within the range allowed by yours? Nigel - That's great to know the the System Events dictionary lists all the properties of the UI elements, I didn't know that. According to the dictionary, the access to incrementor's "value" property is "get/set," so I'd think it should be working. In my experience with UI scripting, with some programs it just doesn't work and I can't find any explanation. In those cases, I resort to the clunkier method of getting the UI element's position on screen and simulating the mouse click. The idea of putting the control in focus gave me the idea of sending keystrokes to it. I noticed that the resolution 2400 is the max value the incrementor will allow. set myInc to incrementor "Resolution" of window "Export Image" of application process "EAGLE"
This will loop using the increment action until the value is at the max. Interesting! There's no 'increment' command listed in System Events's dictionary when you look at it in Script Editor, but both 'increment' and 'decrement' compile as System Events terms and are listed as things to which UI elements respond. They are listed as commands when the dictionary's viewed in Script Debugger. Well. It's a System Events command in that it's a term which compiles only in System Events and which looks and behaves like a command. But no doubt it sends the appropriate Cocoa signal to target objects.